I am still waiting on Youtube to release the false copyright claim on my Youtube video... It's been almost a week now. Technically, the company Avangmusic is claiming a copyright on the audio of my video. This video was created with iMovie and using the free-of-anything soundtrack provided by Apple. The current status is that Avangmusic is "reviewing" my dispute over their claim and they have 30 days to reply back. That means that my video is currently on-hold until Avangmusic releases the claim or that the 30 days period is reached. Even worse, they could refuse my dispute and I'll have to fight back with another dispute with Youtube. This has happened to me on another video but I eventually won my case (Twitter is a powerful tool). For now, my content is hold hostage of that ridiculous process. The copyright holders should prove that they have a case before Youtube takes any action on blocking contents. In some cases, it can be obvious that there is a copyright issue but if their is any reasonable doubts, Youtube should wait before taking any actions. This copyright claiming process is hurting the community of Youtubers and some of us are actually losing real money because of that. Are you facing the same issue? Make your voice heard by using #stopstealingmyvideos in your social media networks. It's time to end this madness! You can follow me on twitter: @patrickballeux and on G+. This time, the claim is from a company called AvangMusic. They are claiming copyrights on a video I created for ScreenStudio using iMovie for iOS using their Trailer templates. Just a simple trailer video for my personal project ScreenStudio (http://screenstudio.crombz.com). This company claims to hold copyrights on the audio of this video. The actual owner is Apple (http://apple.com) and their licence clearly states that their audio samples and soundtracks are royalties free. Again, this video was blocked and cannot be monetized with Youtube ads. I'm not losing millions of $$$ on this, but it's a loss I do have to endure anyway. Imagine that you would create a vial video, with thousands of views but your monetization would be suspended under the false assumption that this company, AvangMusic, are the copyright holders. Youtube needs to do something about this. It's not hard to identify that this audio track is from Apple and do not infringe any copyrighted materials on the planet. I did take time to tweet @avangmusic about this issue and also sent them an email. Still no feedback from them or Youtube. Until then, I'll hashtags a few tweets with #stopstealingmyvideos on Twitter. If you have faced the same issues with @avangmusic or another companies, use the same hashtag so we can join our voices again that crazy problem. In the last few days, I found out that I was missing a lot of free space on my iPad 4. Something like 2 gigs of free space was missing and I could not figure out why. One of my kids had tried to download a few hefty games that saturated the available space to a point that I had no free space left at all. Download were waiting and the AppStore was requesting that I free up some space to complete the downloads. I rebooted, deleted some apps and everything seemed back to normal. But after doing some math, it occurred to me that there was still a 2 gigs unaccounted for. 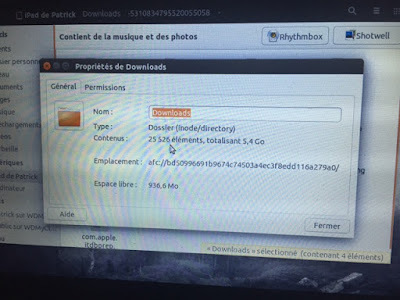 I eventually plugged my iPad 4 on my Ubuntu laptop, to see if the "Downloads" folder could be the stucked with old files in there. 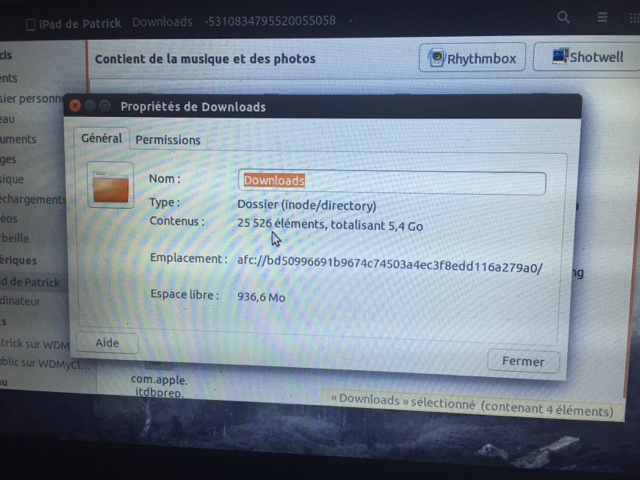 I was surprised to discover that a lot of data was stored in that folder but that the total size was 5.4 gigs! From Nautilus, I manually deleted those files and got back more than I expected. iPhone overheating: Here's a fix! A few days ago, I installed the latest iOS 9.1 public beta on my iPhone 6. It's a bit risky, I admit but I like it. 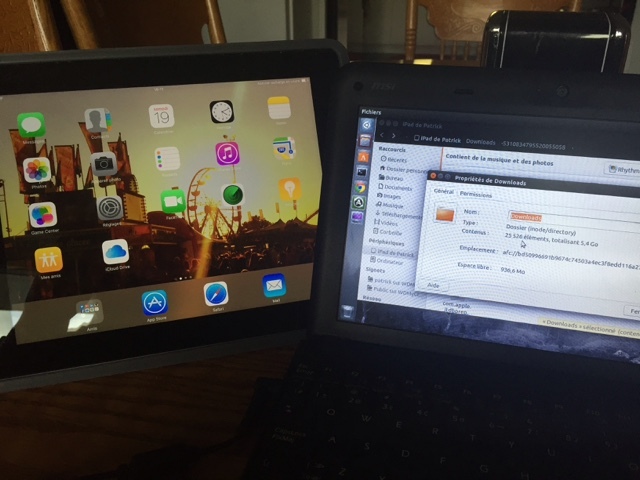 My iPad 4 and iPhone 6 both got iOS 9.0 (public beta) a few weeks ago and everything worked without any problems. When iOS 9.1 public beta came out, I was eager to try it out and discover what was new. Overall, nothing much compared to the prior version 9.0 beside a major issue with my iPhone 6: Overheating issues! Later on that day, I found out that the battery was draining really fast. Usually, the battery will last easily 2 days on a single charge but I have kept the old habit on charging it when going to bed. On a normal day, the battery level will drop to 75% at most. But after iOS 9.1, the battery level was already at 40% only a few hours after disconnecting from its charger. Again, I rebooted the device, re-check all settings, closed all apps from the app switcher... I tried everything and I was considering reverting to IOS 8.4 until the official 9.0 comes out. First, I activated the "Low Power Mode" and switch back to the "Normal mode" in the general settings (available on iOS 9.x only). Then, I deleted the Apple Beta Certificated from the General Settings expecting an "update" reverting me to the official iOS 8.4. Nothing happened actually so I decided to re-install the Apple Beta Certificate to get the next iOS 9.1.x public beta version just in case. I was willing to wait another full day, preparing a full recovery to iOS 8.4 if the problem would still show up. It's been 24 hours since then and the overheating issue seems to be resolved. I don't know if flipping the "Low Power 'ode" did the trick or simply re-installing the certificate for the public beta did the job but something got fixed along the way. One thing is sure, rebooting the device did not fix anything as I had already rebooted many times. For now, I can assume that one of those two operations fixed the overheating problem on my iPhone 6. As a side note, nothing happened on the iPad 4, still working like a charm with iOS 9.1 public beta. Did you fix your overheating problem with this tip? Let me know. I just watched the latest Apple event about their new products for this year. There was a lot to see but mostly, the new AppleTV is the one that got my attention. As I watched the features of the new device, my mind was also on Nintendo. The new AppleTV will do to Nintendo what the iPhone did to Blackberry. It's a game changer, it's more than a multimedia device. It's fantastic! As usual, the AppleTV will let you watch movies and listen to music as it did in previous incarnations. But apps will be available, in a full HD display in your living room. It's not just apps, it's games that are as beautiful as you can have them on your iPhone or your iPad. You can also get interactive content while watching tv shows, sport events and more. It has remote voice control, multiplayer capabilities, great graphics and a lot of content to offer. One really cool feature is movies and tv shows are not only available on iTunes from the main screen. The AppleTV will let you search and browse movies, and offer you to watch them from iTunes, Hulu, Netflix and other services eventually.